Vending services are provided by the Coca-Cola Bottling Company and Canteen Vending. Providing high quality and convenient beverage, snacks and Fresh Food vending services to the UH community is important to us. Exclusive beverage vending service to UH is provided by the Houston Coca Cola Bottling Company. There are over 160 Coke beverage machines conveniently located on the UH campus, University Business Park, the UH College of Pharmacy at the Texas Medical Center and at the Small Business Development Center in downtown Houston. Vending Service Exclusive snack vending services to UH is provided by Canteen. Canteen vends snacks, fresh foods, frozen foods and hot beverages (coffee and hot chocolate) to the UH campus, University Business Park, the College of Pharmacy at the Texas Medical Center and the Small Business Development Center in downtown Houston. 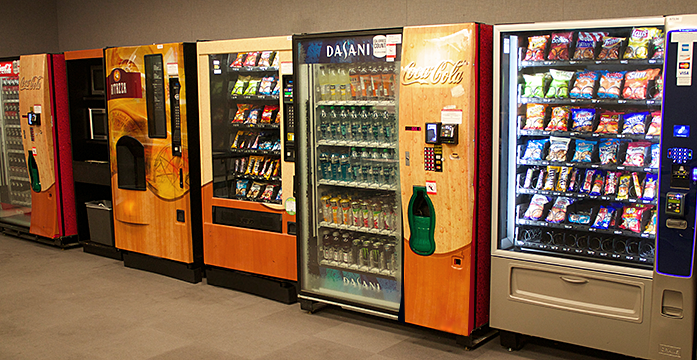 If your department / division / office is interested in obtaining vending services for your area, please email your request to vending@uh.edu or contact our offices at 832-842-9053. Utilization, traffic patterns and required minimum sales are determining factors in the placement of vending machines. Your interest is greatly appreciated.